It is impossible to satiate curiosity of Human mind. Often we wish to unveil what is hidden irrespective of the consequences our irresponsible pricking may yield. Though we try to ignore the faint cry of our soul in favour of noisy outdoors but at times it becomes so dominant that you have to listen and follow your intuition, even against all judgement and this is exactly what happens with Korobi in Oleander Girl, latest novel by Chitra Banerjee, one of my favorite authors. As I had read Arranged Marriage only a short time ago and was still in the grip of those powerful stories, initial few pages of present novel made me feel that here also the predominant theme is wedding. But, as the story progressed, the novel acquired an altogether different hue and the focus all of a sudden shifted to family secrets and Korobi’s unknown past that is sure to blemish her future. Oleander Girl begins in Kolkata, where Korobi, granddaughter of prestigious lawyer Tarak Prasad Roy is getting engaged to Rajat Bose, the only heir of a well to do business family. The match seems to be made in heaven and blessed by parents on earth. But, on her engagement day, Korobi has a strange visitation that changes the track of her life. She sees the ghost of her dead mother, who looks worried and wants her to look beyond the ocean. The dream is unclear and confusing for Korobi. And as the elders prepare for a beautiful mingling of traditional Roys and enigmatic Boses, 18 year old Korobi is assailed with doubts. Rajat Bose was her choice. Just a few months ago, she had fallen in love with his charming looks and devil-may-care attitude and even convinced her disciplinarian grandfather about Rajat being the perfect husband. But, now when everything is going smoothly, Korobi has a bad premonition. She has not seen either of her parents, not even in photographs as apparently both of them died in an accident, immediately after her birth and Tarak Prasad in his rage had destroyed every single memory of their existence. She is curious to know about them, but her grandparents have always spurned her questions. Now, standing on the threshold of a life changing event, Korobi is adamant to know all about it. But, before she can coerce her grandparents to spill out the secret, she has a tiff with her grandfather and he dies. Korobi is heartbroken and angry with her adamant self but by chance, discovers a dark truth about her father that is sure to change her attitude. Will Korobi be able to know the truth about her parents? Or will she be forced by Rajat’s sincere love to forget her past and move on with life? Why was Tarak Prasad so apologetic on his death bed? And, why was Korobi named after a poisonous plant? These and many other questions bombarded me as Chitra continued with her coming of age story about a girl and her past and I had a great time reading the novel, written in poetic prose. 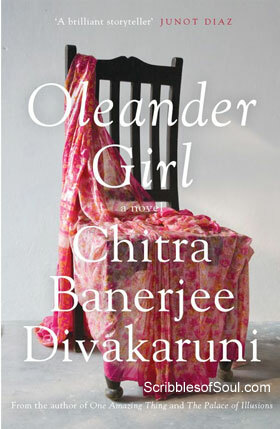 As is typical with Chitra, Oleander Girl is a multilayered story, with three parallel plots. One is as I described above about Korobi and her parents, the second involves Rajat and his ex girlfriend and revolves around Boses struggling to run a successful business amidst communal tension in Kolkata and New York and the third plot revolves around Boses’ driver Asif, who provides an unbiased bird’s view of the other two plots. Chitra invariably mingles her stories with current events. Here also, the Godhra Riots and Twin Tower Tragedy play an important role in enhancing protagonists’ problems and gives the story a real feel. But, the best thing about the novel is its rich symbolism and variety in narration. The plot involving Korobi is written in first person while the other two plots are narrated in third person. Before reading Guide, I always thought that it was bad writing to mix narrating voice but after reading lots more by R. K. Narayan and Chitra Divakaruni, I have realized that this variety can be a real boon and layered effect can be strategically achieved by varying pace and voice. Symbolism and literary techniques are constant companion in Chitra’s novels. And here also right from the name of title and protagonist to the dreams and premonitions, the author continued to surprise me with her prose in motion. As Korobi narrated her story, her protected childhood, unexplained absence of her patents’ belongings and moody authoritarian behaviour of his grandfather, I realized that my initial impression was wrong. This book is not about Korobi’s love or wedding but is an attempt to discover her true identity. There is a family secret buried deep beneath expensive heirlooms of Roy household and I had a great time exploring the hidden aspects in Korobi’s life. As I said in the beginning, I am a huge fan of Chitra and Oleander Girl has once again reaffirmed my belief in her talent. Though, initially, I felt that the present novel is too modern and fast paced and I am going to hugely miss on tidbits of traditional Bengali culture, Chitra usually puts in her stories. But, once the initial excitement was over, the story settled into the familiar territory and despite it being a suspenseful family drama, I was able to enjoy every morsel. Though I am not very satisfied with the climax as I expected a more intriguing end to the mystery but still it is a good read. I could see some shades of Sister of My Heart in Oleander Girl and at one time, seriously thought that Korobi would be finally portrayed as the daughter of Basudha of Vine of Desire, especially when Sardarji was mentioned in passing. But, the story belied all my preconceived notions and turned out to be quite different from her previous novels. All in all, Oleander Girl is yet another good story by Chitra Divakaruni with well developed characters and superb narration.